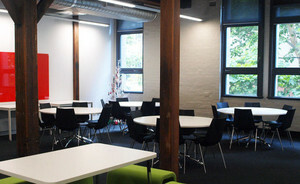 Meeting and Training Space located in the Fusion Building, Ultimo, Sydney. Pricing Full day booking $570 plus gst full day for full space including training room, break out and boardroom. (Recommended) For full day bookings of 8 hours, booking time is 9am-5:00pm Half day booking $350 plus gst For half day bookings of 4 hours, booking times are either 9 am to 1 pm or 1:30 pm – 5:30 pm. Any other time frames like 11 am to 3 pm a full day booking is required. Hourly bookings for the boardroom only. $70 plus gst Minimum 2 hour booking Monday to Friday.